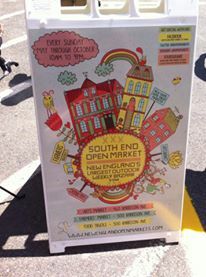 Every Sunday from May to October, the South End hosts a HUUUGE open air market that attracts hundreds of people. 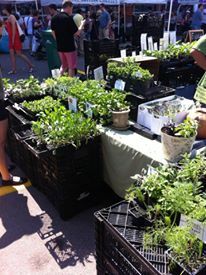 On Harrison Avenue, the market is a couple blocks long intermingled with local businesses and art galleries. 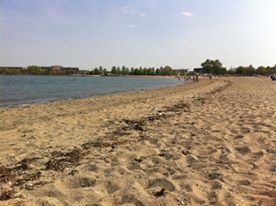 This unfortunately isn’t super accessible by the T, the closest stop is Tufts on the Orange Line but on a nice day the walk isn’t bad! You can pay $10 for parking at SOWA or you can be like me and circle the block hundreds of times or park a mile away for free. 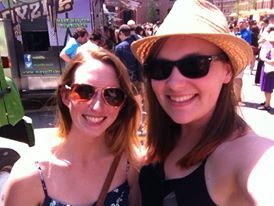 I spent an entire day at SOWA making it well worth the trip! 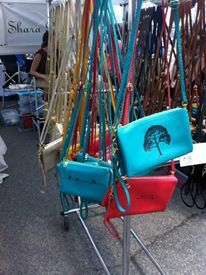 SOWA is so cool because all of the vendors are local individuals or businesses who are all very excited and friendly. 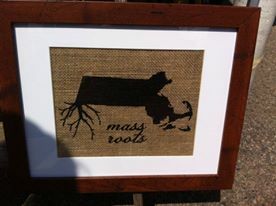 Amongst the art market, there was a ton of visible talent! 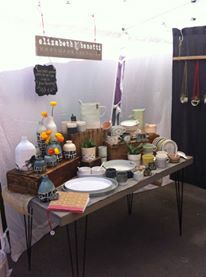 Jewelery makers, screen printers, painters and artists, clothing makers and designers- it’s like one GIANT Etsy shop. All of the businesses nearby also have their doors open! We went into a shop called Bead + Fiber– a total dream for jewelry makers! I got totally overwhelmed in there but it’s still fun to look around and try to come up with your own designs. Also nearby were galleries, fancy hat shops and other restaurants. 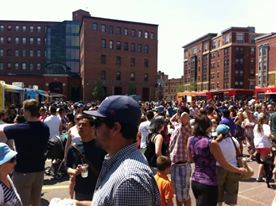 Inside one of the buildings was the SOWA vintage market. 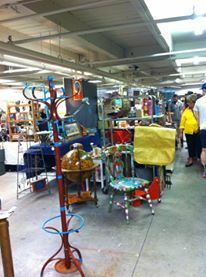 It was in the basement of a giant warehouse and was equally as interesting as the rest of the arts market. 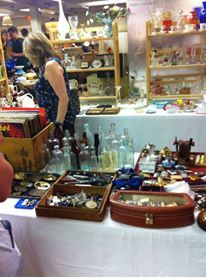 Each vendor had a small spot in this giant room where they displayed their antiques and other pieces. 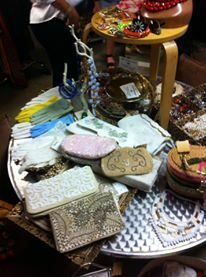 Literally anything from old beer bottles, to Canadian go-go dancer boots from the 50s to vintage clothing. It was so cool to just look around and even talk to people about the story behind their collection! Next up was the food market. Similar to the way the arts market is set up, Each food vendor had its own tent. 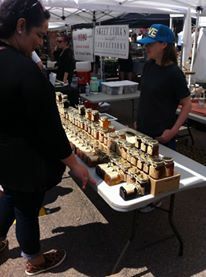 I went around talking to a bunch of the vendors asking questions about how they flavor their seasalt or where they source their products from. 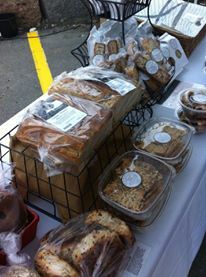 Some vendors sold meat and dairy, others sold bread and pastry products and others even sold dog treats! I bought a DELICIOUS boule of Spinach, Garlic and Caramelized Onion bread from When Pigs Fly. HOLY YUM!! 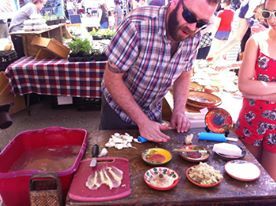 Another stand at the food market was selling these ceramic hand painted plates that had grooves in them. They were used as an alternative to a grater or microplane! You could grate hard cheeses, mince garlic and even zest hard spices like nutmeg on it. It came with a brush and garlic roller too. The whole thing seemed so easy to clean too- I was pretty hooked. It was $25 for the set but I wasn’t willing to pay that much but it was still cool to watch a demo on how it worked! Lastly, the food trucks are amazing. 10 or so food trucks come and sit on an empty parking lot at SOWA and then plastic folding tables and chairs are set up in the middle. My friend and I got Strawberry Slushies with boaba inside which was SO good! I never had boaba or bubble tea before until that day. I’m a fan! 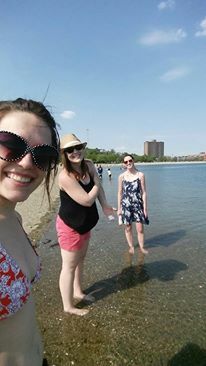 After spending a couple hours at the market, my roommate, friend and I all headed to Carson beach to sit and soak up the sun for about an hour! 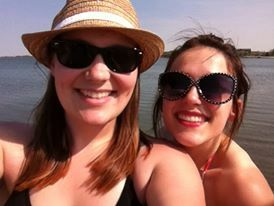 It was a really spectacular day filled with Vitamin D and endorphins. 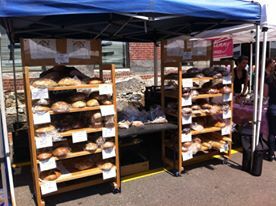 Add SOWA to your to-do list when you visit Boston! Check back again on Thursday for my food-related Netflix recommendations because lord knows how much I love Netflix. Until next time! Thanks for reading!